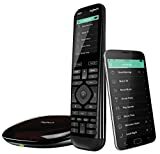 The Logitech Harmony Elite Remote Control and Harmony Hub bundle is by far the best deal on the planet right now as far as universal remotes go. This killer bundle typically sells for $350 and it includes two items. One is the Logitech Harmony Elite remote, which is by far the best universal remote the company has ever made. And the second is the Harmony Hub, which lets you control all of your gear from your smartphone or even with your voice thanks to Alexa support. This bundle is on sale right now at a huge $120 discount, so grab one while you can.